The new apartment did not have any gardening space, so all I had were a couple of herb pots near windows- basil and cilantro. My conversations with friends revolved around how I need to find new space for gardening. We recently moved to a new house with a backyard and a frontyard. The first thing I did after I moved was make a trip to the farmer's market and buy some tomato and pepper plants. And I planted some lettuce, zucchini, and okra plants. It's late for the season, but I am hoping for a late bounty. The cherry tomato plant is in full bloom and I just harvested the heirloom "camp joy" and used it in a fresh salad for tonight's dinner. 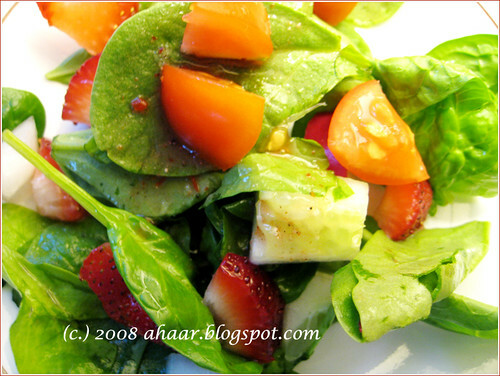 Chop all the vegetables and mix it with the baby spinach. Pour the dressing just before serving. This salad is going to Grow Your Own hosted by Bee and Jai at Jugalbandi. The event was started by Andrea at Andrea's Recipes. Marathi, Tamil, Kannada, Hindi. Madras (when it wasn't Chennai), Bangalore, and Allahabad. And to this, add Athens, Bos ton, Madison, Buffalo, and Ann Arbor. It's never easy to answer the "where are you from" question. Cliched as it may sound, in many ways it is like peeling the layers of an onion - depending on the place and who is posing the question, one makes quick decisions about how much to reveal. And while it is certainly wonderful to be able to draw on so many experiences and influences, there is no denying the value of rootedness either. For me, it is about belonging to a community of thanjavur maharashtrians (here's a wiki entry). And like in any other community, food was central to the process of crafting identity. Poriyal with a little twist, is bhaji; vatha kuzhambu is modified a bit to make goddu pitla; poricha koottu becomes a sappak pitla; and there are many new dishes that emerged from the experimentation that went on in thanjavur-marathi kitchens across south India (present-day Tamilnadu, Kerala, Andhra Pradesh, and Tamilnadu. My immediate family - across 3-4 generations - is from Coimbatore, Pudukkottai, and Madras). What's more, given that migration from the Maratha kingdom to different regions of south India dates back to the 1600s, who knows which Tamil dishes are a result of Marathi influence. As one story goes, sambhar was the result of a tanjore ruler (Sambhoji) substituting tamarind for kokum (a tart fruit native to the western coast of India)! Anyhow, I've been meaning to start a series on Ahaar as a way to document this interesting food culture and, of course, indulge my cravings for what, to me, are the aromas and tastes of home. 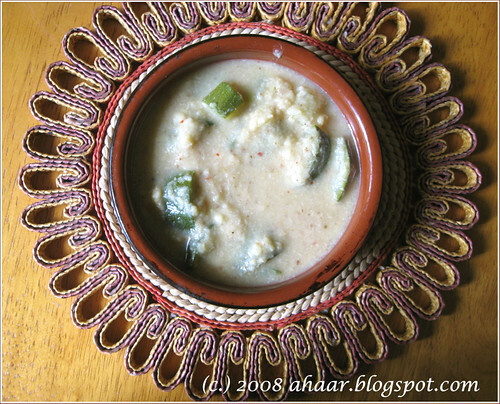 To kick things off, here is the recipe for sappak pitla (sappak: not spicy). As a kid, I always wondered why a dish that was quite spicy was called "sappak"...I still don't know why, and neither does my aji (grandmother). Boil moong dal along with diced ridge gourd. You don't have to do this in a pressure cooker given that moong dal cooks quite fast on the stove. Heat the oil and roast the coconut, jeera, green chillies, red chillies, pepper, chana dal, and urad dal. 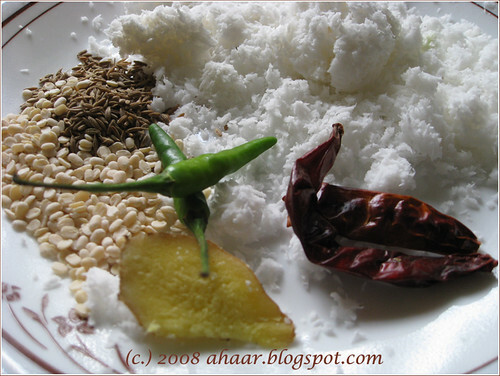 Grind the dry ingredients separately, and add to a paste of coconut and green chillies (ground with a little water). 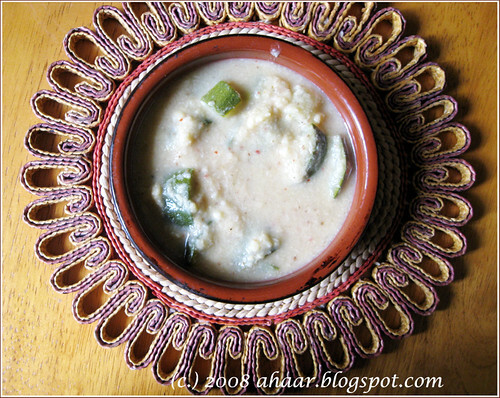 Add this mixture to the dal and ridge gourd and cook on low flame till it comes to a boil. Garnish with cilantro, and serve hot with rice. The Farmer's Market is in full swing now, as you may have seen from the previous posts. I did go to the Saturday Farmer's Market a couple more times with my parents, but forgot to click pictures of the veggies later on. So this time, I had my camera ready as soon I came home. 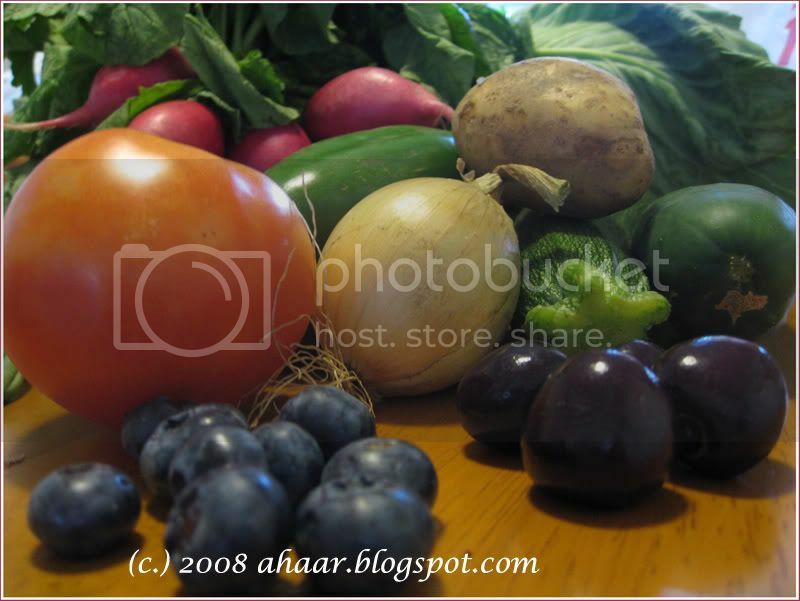 Now a days I pick up the week's veggies from there along with some delicious berries and fruits. I even saw some fresh tart apples in a couple of vendors tables. This week I picked up fresh tomatoes, potatoes, onions, zucchini, cucumbers, radish, cabbage, green peppers along with Traverse City Cherries, and fresh blueberries. The cherries were devoured in a few hours and I have kept the blueberries aside for homemade preserve. 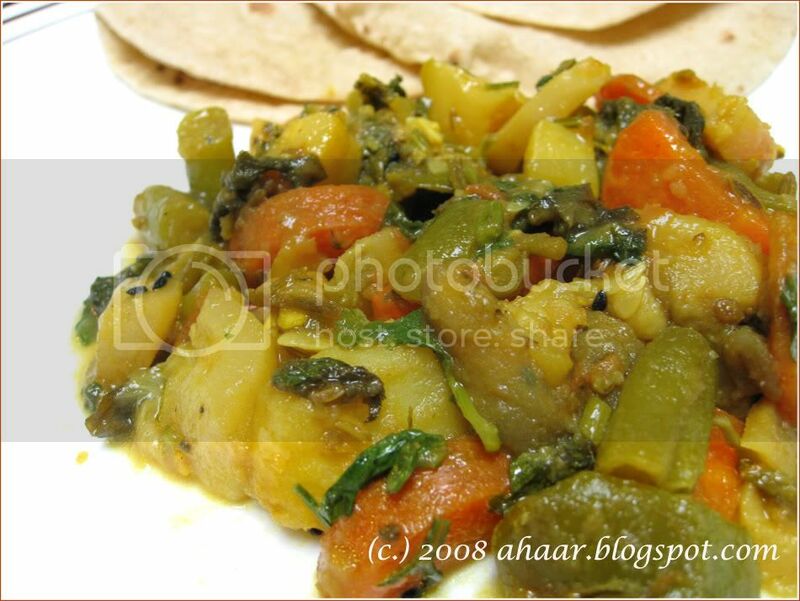 I made aloo zucchini sabzi with the zucchini. The tomato plants are also doing well, and there are small tomatoes ripening fast in the sun :) I may be able to make it to your event Bee! What started as an experiment has become a passion over the years. Part diary of what I cook at home, part exploration of other food-related interests, the blog has contributed to our better eating habits. And over the years, I have blogged about the unexplored, the elaborate traditional and the simple everyday food. It would not be possible without the support of the blogging community and Indian food lovers. 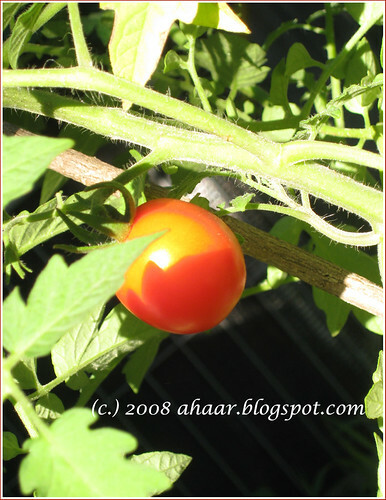 So THANK YOU for reading Ahaar, trying my recipes and for your enthusiastic, and informative comments. You make it worth every minute! 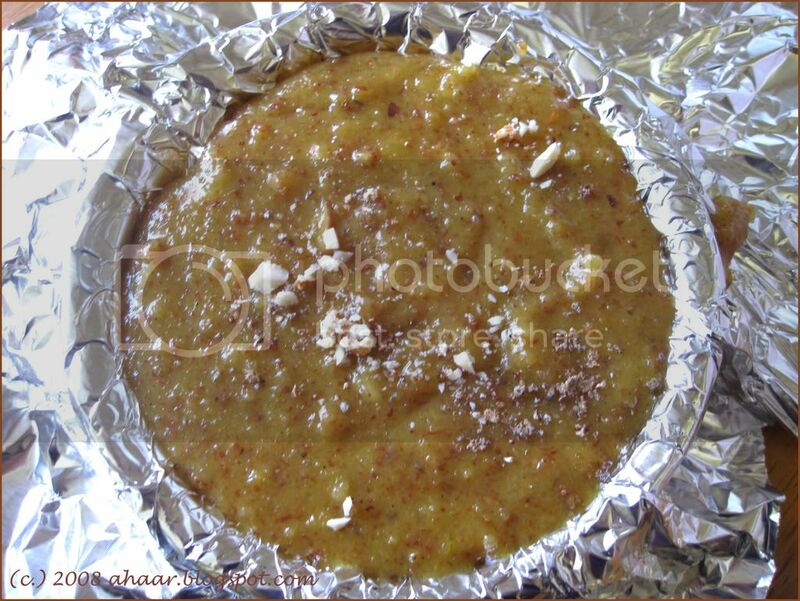 So to make it extra special, I made some Badaam Halwa, the same Halwa I sent Asha of Foodie's Hope, and she talks about in her post. It turns out fabulous every time I make it. Crush the Almonds in a food processor to a fine powder. 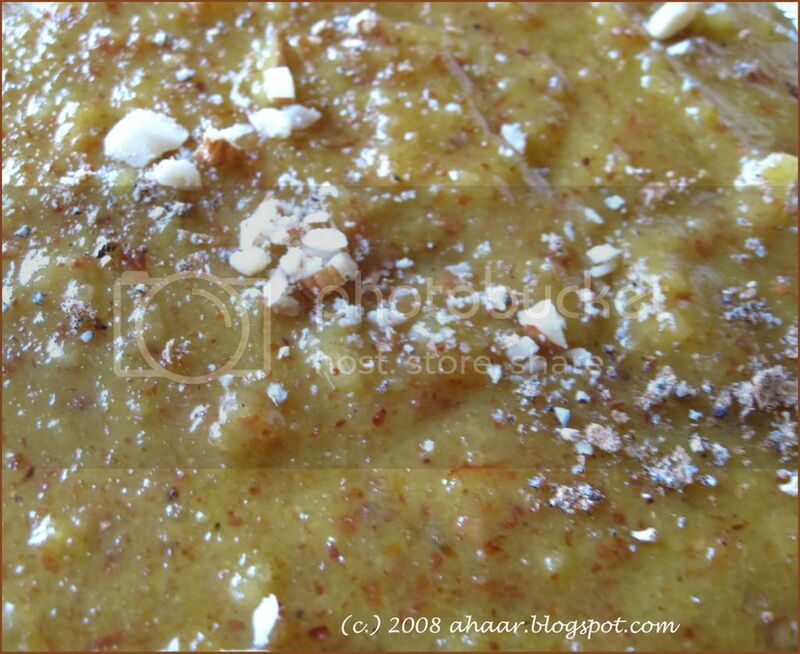 I like to leave it a little chunky as it gives texture to the halwa. 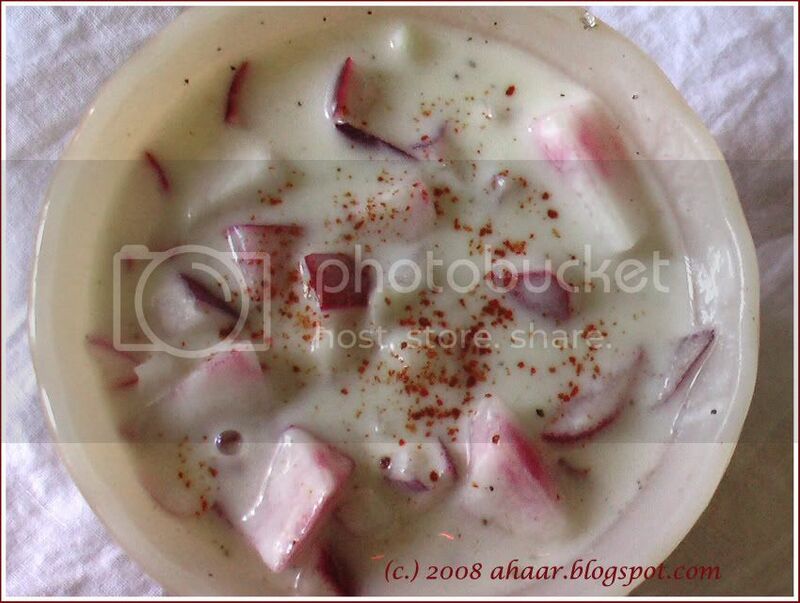 Soak the saffron in milk and keep it aside. Heat the ghee in a deep bottomed pan and then add the almond powder. Saute it for a couple of minutes till you start getting the nutty aroma. Then add sugar and milk and let it cook on medium heat. Once the mix has come to a boil, add a tbspoon of MTR Badam Halwa mix and let it simmer on medium low heat on closed lid for 5- 6 min. Add about half of the saffron to the Halwa and let it cook for another 8-10 min. It should become a thick mix, but not completely dry. Add the rest of the saffron, mix and take it off the heat. Garnish with cardamom, some crushed almonds. Let it cool and serve. Since saffron is part of a flower, this is going to Soul Food who is hosting JFI:Flower Power this month. I have had a busy week! You see, my parents came last week and I have been showing them around town. They are enjoying visiting the Farmer's Market, different cuisines, walking around the University, parks and other local stores. 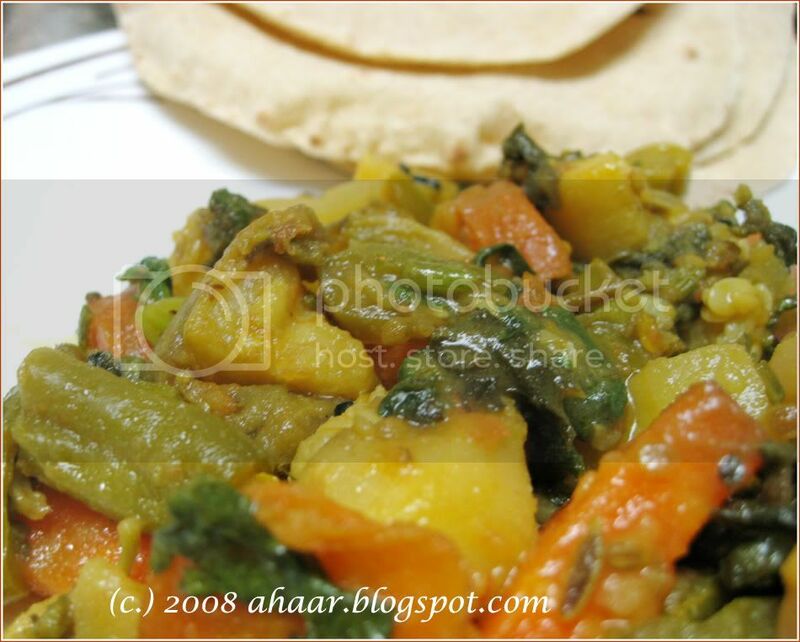 I want to start with Panch Mishali Tarkari, which literally means Five Vegetable Medley. Five vegetables (this had radish and radish greens, green beans, eggplant, potatoes, carrots) are cooked with panch-phoron, ginger and chillies and tastes delicious with some rice and simple dal. 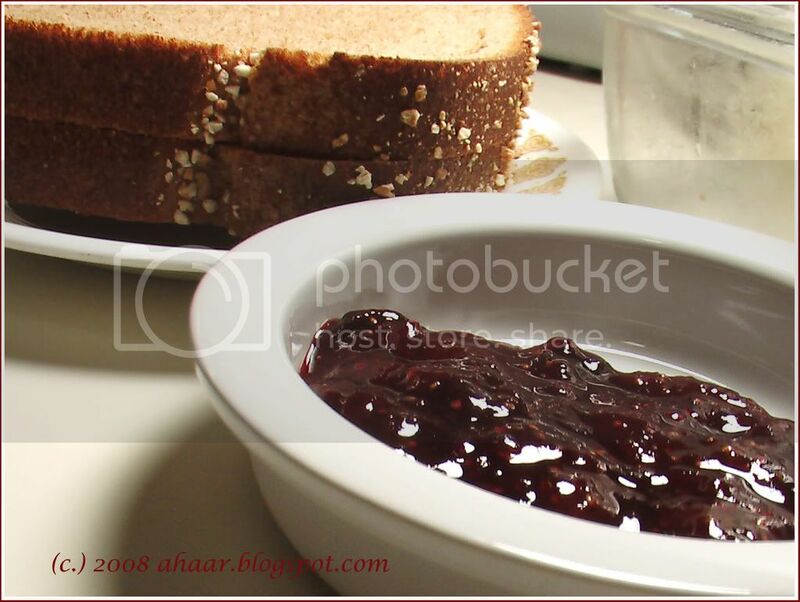 It's usually eatan as the first course of a Bengali meal. Here is how they made it. 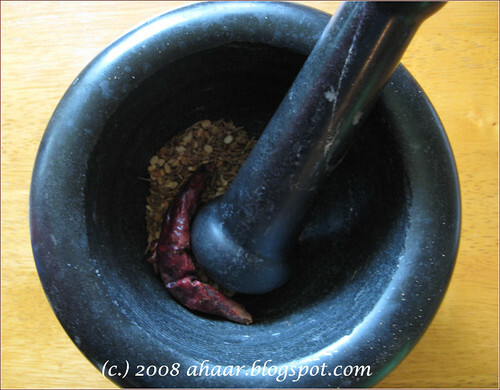 Grind the ginger and green chilli paste. Keep it aside. Now heat oil and temper it with asafoetida, panch phoron, bay leaves and red chilli. Then add the turmeric powder to the oil. 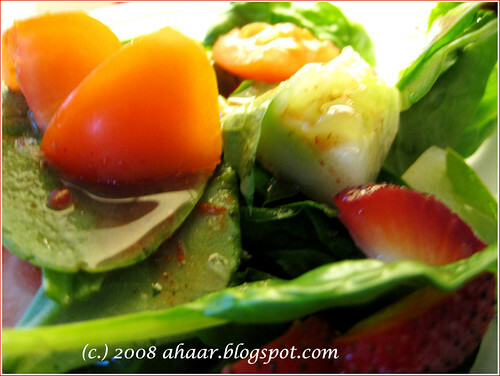 Then add the chopped tomato and saute for 2-3 minutes. Next add all the chopped vegetables and let it cook for 7-8 minutes on low medium heat on closed lid. One the vegetables are semi-cooked, ad the ginger and green chilli paste and cook it all together for another 5-6 minutes till the vegetables are cooked and the water has disappeared. Take it off the heat and garnish with chopped cilantro. 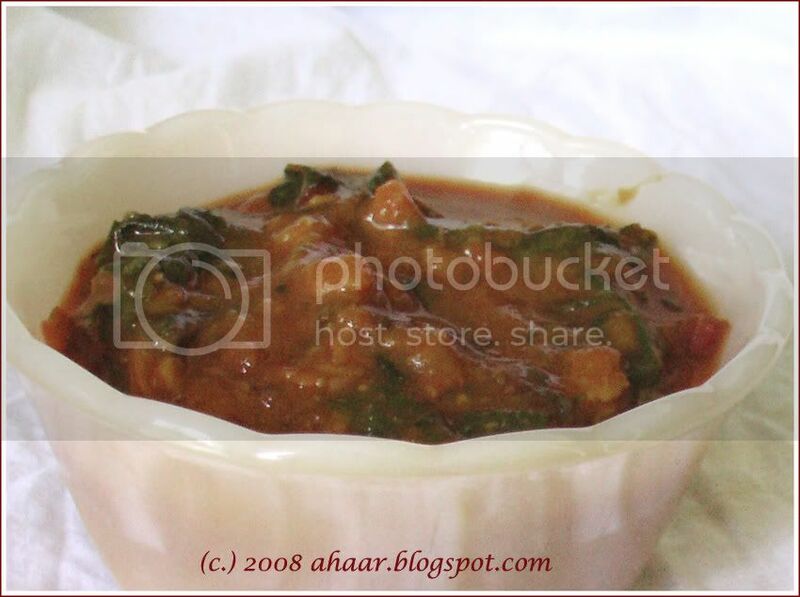 Serve with dal, rice or even with chapati. 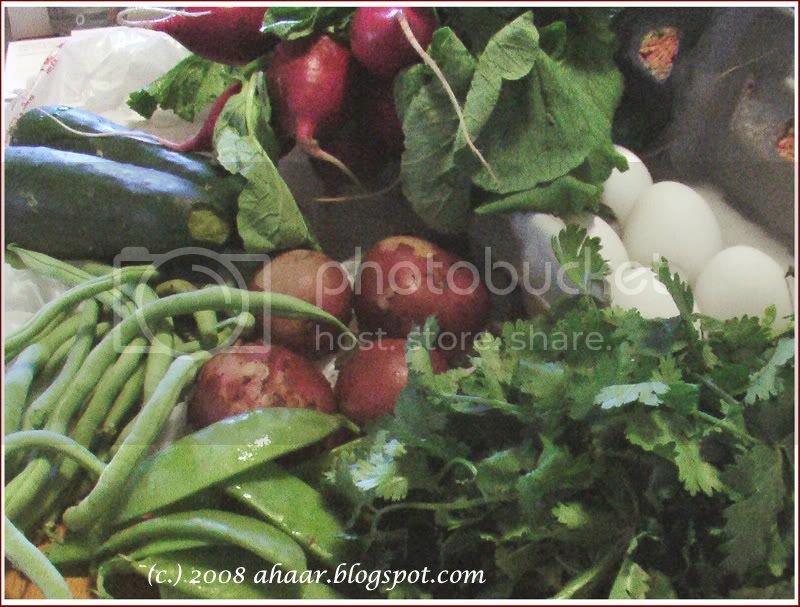 This delicious vegetable medley is going to Weekend Herb Blogging being hosted this week by Archana at Archana's Kitchen. WHB was started by Kalyn of Kalyn's Kitchen. After using the last of the strawberries from Farmer's Market, I was ready for my next trip. The weather was great and the market was bustling with people and shoppers. There was a lot too choose from the vegetables, flowers and plants along with fresh-baked goodies. I was enthused by the energy of the shoppers and the variety of fresh goodies on display, and decided to take full advantage of that. I bought some freshly dug potatoes, big bag of beans, bunch of radish (they are so juicy, yes I've already had some), cucumbers, snowpeas (the last of this season, I think), a big bunch of cilantro and garlic. And then I decided to buy some organic, free range eggs. I bought half a dozen and will be making some garden omelet for tomorrow's breakfast! Remember the strawberries from the Farmer's Market? After I had my fill of fresh strawberries, I still had a good bunch left. And after dreaming about strawberry shortcake and other pies and tarts, I decided on trying something different, something I have never tried before. 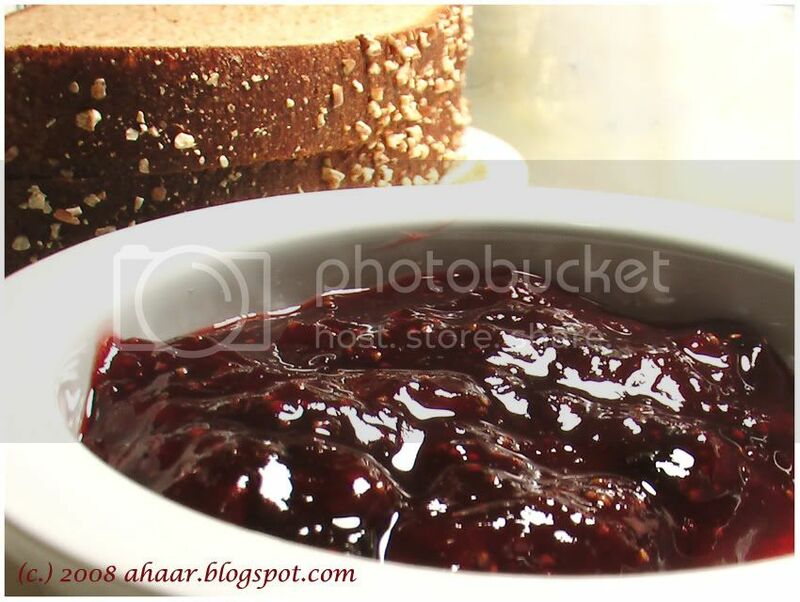 "How about jam?," the little voice inside me egged me on, so I looked around and found a simple and delicious-looking recipe on Arabic Bites. 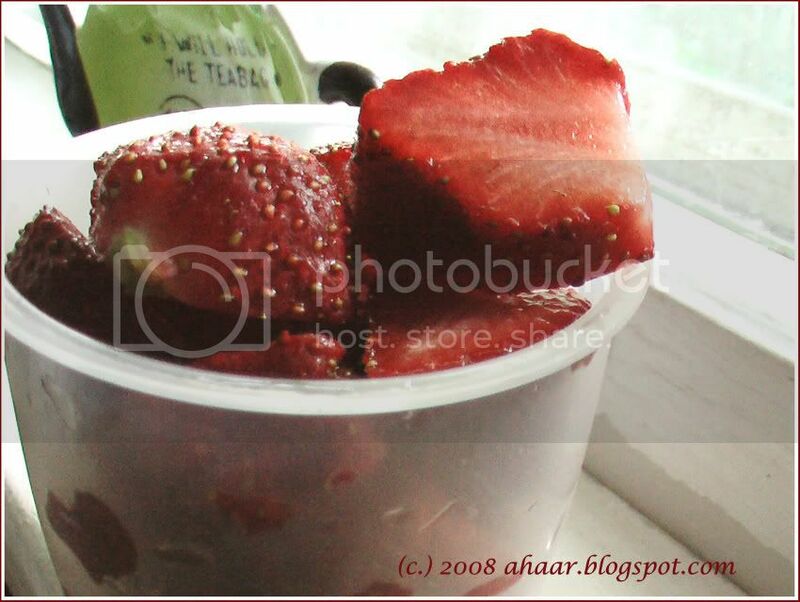 Boil the sliced strawberries on a thick-bottomed pan. Once it starts boiling add the sugar, lemon juice and 3/4 cup water. Let it cook over medium low heat and closed lid. When the mixture starts to thicken, add the lemon zest and clove powder and let it cook for another 10-15 minutes on medium low heat without the lid. Keep checking till you feel the consistency is right. Take it off the heat and let it cool. Then pour it in sterilized bottles. Serve with butter and bread (my favorite combination) or make up your own. It made one delicious lunch.